Dive in Tulum's famed cenote sinkholes - DestinosFun! If you like aquatic adventure, the Riviera Maya is the place for you, as it boasts some of the world’s most exotic and interesting underwater cave formations. The caves grow out of sinkholes called cenotes, reports the Globe and Mail. 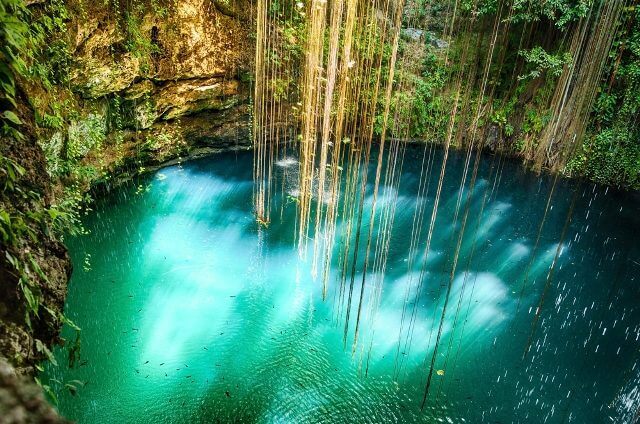 The Yucatan Peninsula features around 3,000 freshwater cenotes, many of which are open to exploration by intrepid divers. The source suggests that people looking to dive in the cenotes should base themselves in Tulum, a small town around two hours south of Cancun. One of the best diving spots in the area gives you two sinkholes for the price of one – the Gran Cenote and Dos Ojos Cenote are linked underground by a 400-meter-long tunnel. Would-be spelunkers can swim through the channel, leaving behind the sun-kissed blue waters of the open cenotes and getting a chance to see twisted cave formations that never see the light of day. The largest cluster of cenotes in the Yucatan is the Ox Bel Ha system, which the source says features up to 180 kilometers of inky tunnels and passageways connecting its sinkholes. If you want to explore Gran Cenote, Dos Ojos or the Ox Bel Ha system, you can contact the Cenote Dive Center to take a cave-diving course and tour.